Ok, I admit it! I couldn’t bear to throw away the plastic rings that come with the platters of small shrimp you can buy for entertaining. I’ve never seen them used in crafts, but I knew there had to be something you could do with them, instead of tossing them away. Well, I just spent the afternoon making homemade Christmas wreaths from my collection of shrimp rings. It turns out that the plastic shrimp ring centers are the perfect shape to make homemade Christmas wreaths of all kinds. It was fun, relaxing, and now I have a wreath for every door! This would make a great group craft, or a nice activity to do with your kids. Just assemble the supplies, choose your garland, and begin! Cut out the inner circle of the plastic shrimp ring, as shown in the photo at right, leaving a plastic circular frame. 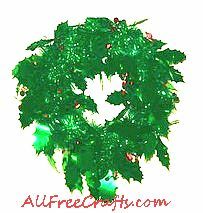 Wrap the circular frame with a glitter garland or traditional green garland. 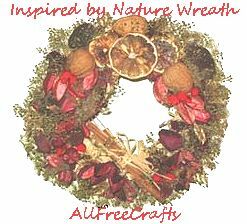 You can experiment here to see how “full” you want the wreath to become; if you want the wreath to be predominantly made of the garland, use the full six feet. 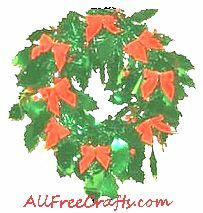 However, if you want to display a nice variety of Christmas decorations on the wreath, then three feet of garland will probably be enough, because you can fill the spaces with decorations. Glue only the ends of the garland in place – this allows you to push parts of the garland up and around the frame as you begin fitting in ornaments. Make a trial run. Set the wreath on a table and experiment with the placement of decorations until you have a pleasing effect that looks balanced to the eye. As a rule of thumb, place larger ornaments toward the bottom of the wreath so the wreath will not look “top heavy.” The center top and center bottom ornaments are important in establishing a balanced design – both should be larger than ornaments placed on the sides. Begin gluing ornaments in place. Use hot glue or tacky glue to attach the ornaments directly to the shrimp ring frame rather than the garland. If you are using a bow to accent the bottom of your wreath, like our example, use the wire that comes with the bow to attach it to the shrimp ring. You can add glue to secure it firmly into position. Wrap lengths of raffia around the shrimp ring frame to create a natural colored base. Glue red rose petals around the face of the wreath for contrast in color, although the petals do not have to cover the wreath completely. Add your choice of dried orange or apple slices, walnut halves or other nuts, seed pods, rose buds, pieces of potpourri, cinnamon sticks or dried flowers. Fill spaces with baby’s breath. This wreath uses six feet of holly glitter garland available for a dollar at many dollar stores. Simply wrap garland around the shrimp ring and glue the ends in place. 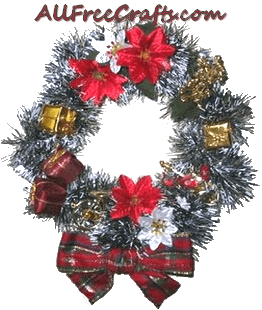 The same wreath shown above, with the addition of bright red bows. I like to have ideas to make things to sell or give as gifts to friends or neighbors. Me too. Homemade things are so much nicer.